With one of the largest cash in transit fleet in India, SIS Prosegur Cash Services guarantees the best transport service in the market for movement of cash and valuables. 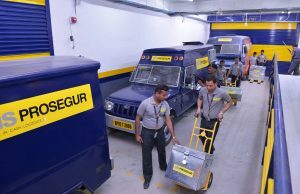 SIS Prosegur’s fleet of secured vehicles, distributed across a vast network of local branches, guarantees extensive regional coverage and makes it possible to attend to any pickup and transport requirements.The valuables are transported in secured vehicles, which are specially fabricated. Our cash vans are installed with vehicle tracking system and are monitored and tracked by highly professional staff.We have expertise in safe and secure transportation of cash, coins and other valuables on behalf of our clients from one point to another. S&G locks on the vault area of Cash van.